Fire crews started the night by helping a person who was stuck on Bishop Peak, Interim Chief Keith Aggson said. Rescuers brought the person down the mountain just before midnight. At about 2:45 a.m., a man became stuck on an “island” created by two channels of water surrounding him at the Bob Jones trailhead. The water rose to six to seven feet, prompting the man to take to higher ground and eventually climb a tree. Firefighters staged in the area but waited until 6 a.m. to attempt the rescue because of the heavy flow of water and vegetation in the area. Once rescued, the man declined medical treatment. He said, though, his entire encampment had been washed away. 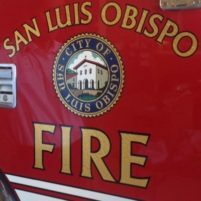 As the rescue at the Bob Jones trailhead was taking place, fire personnel learned that a couple in a tent was stuck in a creek bottom about a quarter mile away, just south of Los Osos Valley Road. The man and woman were about 25 feet down an embankment. Firefighters used a rope to lift the couple to safety. They, too, declined medical help. Fire officials and park rangers are instructing people sleeping in creeks or drainage areas to move to higher ground when storms are approaching. Because a lot of towns acknowledge the issue of homelessness, but don’t create solutions because of this concern or that concern. Now you’ve got underground people. Gee, thanks for the tip! How about why the f are they sleeping in a drainage channel or a creek??? Genius, it will be a sad day when you live down by crik.